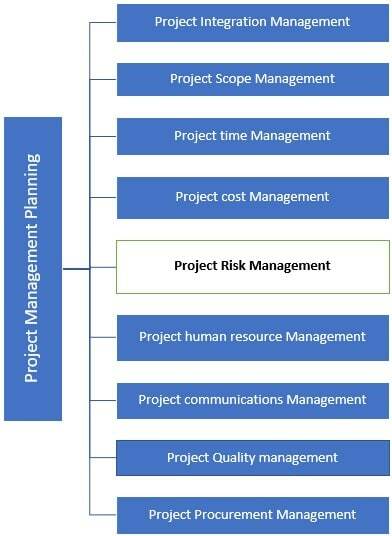 Risk management in construction industry is an important part of the project planning and management. Various risks associated with construction projects such as financial risks, environmental risks, socio-economic and construction related risks are studied and dealt in risk management. The volatility and capriciousness of the environment in the construction industry was never hidden from anyone. It’s easily influenced by external factors (technical, design, logistics, physical, operating, environmental, socio-political, force majeure et cetera) which are capable of not only derailing projects but can also create an irreparable aberration. Risk management, therefore, becomes a pivotal instrument that helps us deal with the culling out of various risks, their analyses, and the remedial steps that could be taken to avert them in a particular project. The major risks that usually crop up in front of a project manager while helming a construction project are: financial, socio-political, environmental, and construction related. Vacillating exchange rates, material costs, market demand, improper estimation, inflation, payment delays, unmanaged cash flow and financial incompetence of the contractor pose a huge threat of financial risks in a project. Amendments in governmental laws and regulations, law and order, bribery, payment failure by the government, increase in taxes and change in government form this repertoire. Inclement weather conditions, natural disasters, accessibility to the site, pollution and safety norms constitute the environmental risks. Failure of logistics, labor disputes, design changes, labor productivity, rush bidding, time-gap for revision of drawings, shoddy work quality due to time constraints et cetera comprise the construction-related risks. Risk management process is nothing but a series of steps that help identify and migrate the risks for the successful closure of a project. If done correctly and sincerely, construction risk management will reduce not only the likelihood of an event occurring, but also the magnitude of its impact. In the simplest terms, Risk management process is taking preemptive actions to avoid and minimize any kind of jeopardy to a project in future. All the relevant people associated with the project convene and discuss all the aspects of the project comprehensively and raise their ideas and thoughts foreseeing the risks in their perceptions. There is a facilitator who notes it all down and differentiates between the imperative and unnecessary ones. 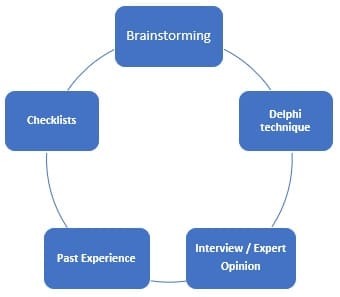 Questionnaires are answered in anonymity by a group of expert panelists in rounds followed with an aim of converging towards one mutual answer by improved judgement after consecutive rounds. The process is stopped after a predefined stop criterion (no. of rounds, stability). Experienced personnel and relevant people are consulted for their opinions and advice to avoid factors affecting risk. Similar projects are brought up and perused rigorously to identify the factors that could affect the project. A predetermined list of all the risks that could pose a threat to the project are delved, drawn and juxtaposed from the previously completed projects with analogous criterion. After all the probable risks have been identified, their valuation is done based on qualitative and quantitative methods. With risk assessment method, available information is used to extricate the frequency of occurrence and the level of consequences in risk management. It is usually used for small and medium-scaled projects and involves listing and collating the risks and prioritizing and deprioritizing them as per the opinions of relevant people. The risks are also rated as high, medium or low depending on the collected opinions and risk tolerance boundaries in the organization. Qualitative method is also used when there is not enough data available or when there is some stiff time constraint attached to the project. Quantitative methods have to do with analyzing the effect of risks with crunching data and numbers and is used for large projects. Some major Quantitative assessment methods are: Decision tree analysis, expected monetary value, expert judgement, fault tree analysis, fuzzy logic, probability distribution, sensitivity analysis, Monte Carlo estimations etc. Quantitative analysis requires a greater effort as it demands oodles of data for getting a precise and accurate analysis. After identification and assessment of the risks are done, available options to avert the risks are marked and discussed in case they ever crop up in future. Besides opting the apt remedial measures for risks affecting the project, positive opportunities too are gleaned from the risks. Risk response is further subcategorized into Risk avoidance, Risk transfer, risk mitigation and risk acceptance depending upon the nature of the risks. Shunning away from the tasks that involve risks is risk avoidance. Though it’s not always possible to avoid the risks this way, it is the simplest way to tackle the risks. In easier terms, steering clearing of the parts of the project that may introduce new risks that may endanger the whole project is risk avoidance. Risk avoidance is most likely to take place where the level of risk is at a level where the project is potentially feasible. There are various ways through which one can transfer risks from their projects to the third parties. Purchasing insurance, outsourcing intricate and sophisticated work to an experienced organization, using a fixed price contract instead of unit price contract and the complete removal of warranty and guarantee terms. Reducing the impact of the risks that are inevitable and nontransferable in a project is termed as risk mitigation or risk reduction. Reviewing your project anew, alleviating complexities in procedure, providing additional testing et cetera are some ways through which one can mitigate risks. Every project carries risk in some form. Some risks have to be hauled and made a part of the project with the consensus of all the relevant parties associated with the project. Keeping cost and time factor in view, management authorities must be informed regarding the consequence in case the risk occurs. To keep a rigorous check on the implementation of Risk identification, Risk assessment and Risk response risk monitoring and control is essential. Along with ensuring the execution of risk plans, it monitors the trigger conditions for contingencies and the probabilities of new impending risks during project execution. Team meetings and every singly checklist created during the initial stage get pored over by the monitoring authority and corrective actions are taken as per the requirement. Monitoring and control is done throughout the life of the project.